When we developed ProStar Coach, we knew we'd have some explaining to do. It's a learning empowerment technology, which means that it's so new and different that often when people see it for the first time, they aren't sure what it is or how to use it. More important, they aren't sure why they need to use it. As I said, we had some explaining to do. 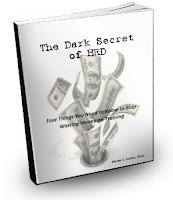 I wrote "The Dark Secret of HRD" to do this explaining - to top management. There are some very important facts about skill development that executives simply don't know. And that lack of understanding might keep them from appreciating the need for something like ProStar Coach. The purpose of this book is to inform you about four poorly understood realities related to employee performance. The failure to acknowledge these four facts has caused organizations in the U.S. to waste nearly $100 billion every year on learning and development programs that fail to change behavior. The book explains why this horrible condition has persisted for decades, and what to do to get maximum ROI from your investment. REALITY #1: Most of the money invested in learning and development is wasted. This is what I call the “dark secret of HRD.” Organizations that invest in training aren’t getting what they paid for. Not even close. The reason is that in the long run, what people learn about in training usually isn’t applied in the workplace. This truth has been on the street for a long time, but for various reasons the message hasn’t reached top management. REALITY #2: At work, people usually don’t think about how to act; instead, they automatically engage ingrained work habits. In a typical workplace, there’s a lot going on and employees have a lot to think about. Under pressure, habits trump newly introduced skills. This reality is a formidable “catch-22”-- most of the time, people won’t use a newly learned skill until it’s ingrained, but they usually don’t do the work to ingrain it because it’s easier to rely on what’s already habitual. REALITY #3: To ingrain a work habit, people have to rewire their brains—they have to apply the skill over and over until the related brain cells connect into a new neural pathway, a process that takes far more time than is available in a training program. This is the biggest reason your training programs don’t “stick,” why 8 or 9 out of 10 participants don’t improve their work habits. The most important part of training has to take place in the workplace—after classroom instruction is over. The failure to follow through with a structured program of reinforcement means most participants will return to their old work habits. REALITY #4: Employees need people skills and personal strengths to work at their best. Even if employees apply what they learned in training, they still may not be able to give you the high level of effort you seek. The reason is that if they lack key people skills or have deficits in personal strength, they’ll act inappropriately with each other and with customers. And they won’t do the hard things when faced with challenges and adversity. As you read through “The Dark Secret,” you’ll learn a few things you didn’t know about the brain. I’ve been studying cognitive neuroscience for over 20 years, and in this book I include a few important insights about “the learning instrument”—the human brain. It’s important to know how the brain learns new skills, habits and patterns; otherwise you won’t appreciate why you need to do what’s necessary to get people to change their behavior. Understanding how people learn is the first step to stop pouring big bucks down a hole. But knowing these things is only the beginning and actually doesn’t make your job any easier. The commonsense remedies are daunting—which may be why few organizations have implemented them. The book finishes on a positive note. In the final chapters I explain why and how we developed ProStar Coach, a unique online self-development service that essentially resolves the four issues that hold you back from getting the results you expect when you invest in training. If you'd like to read the rest of the book, you can download it free online.